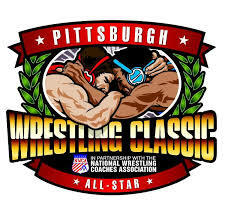 Congratulation to Cornwall senior Will Leonard and Monroe Woodbury coach John Gartiser for being selected to take part in the Pittsburgh Wrestling Classic! Leonard will be wrestling at 220 pounds for Team New York where Gartiser will serve as one of the assistant coaches. The event takes place tonight, Friday 3/15, and can be watched live on FloWrestling beginning at 6:00 PM. An invitation to the Pittsburgh Wrestling Classic, formerly the Dapper Dan Classic, is one of the most prestigious honors that can be bestowed upon a high school wrestler. The main event of the Classic, now in its 44th year, pits an all-star team of seniors from the US against an all-star team of seniors from Pennsylvania. In a preliminary dual, an all-star team of seniors from Western PA (WPIAL) squares off against an all-star team of seniors from another state – this year Western PA will be taking on Team New York! Let’s take a look at the teams that will be competing in this year’s Pittsburgh Wrestling Classic!